We’d love your help. Let us know what’s wrong with this preview of The End of Jobs by Taylor Pearson. Entrepreneurs that understand the new paradigm, have created unprecedented wealth in their lives and the lives The rapid development of technology and globalization has changed the leverage points in accumulating wealth: money, meaning and freedom. — How the Stair Step Method and return of apprenticeships have transformed the “entrepreneurial leap" to make entrepreneurship more accessible than ever. — Full Recorded Interviews with the Ten Entrepreneurs featured in The End of Jobs detailing how they launched their own successful businesses. — Taylor’s 67 must-read business books to fuel your entrepreneurial career. — 49 tools and templates to save you hundreds of hours when launching and growing a business. — Access to a private community to discuss the book and get support from a community of like-minded individuals to inspire, motivate, and assist each other. Early Stage Entrepreneurs - Doubting yourself and wondering if you made a smart choice to abandon the traditional career path? In Chapter 5, The Turkey Problem, you’ll learn the difference between real and perceived risk and why Entrepreneurship is a smarter choice than ever. Established Entrepreneurs - Do you have friends, family or team members that don’t understand their choices? In chapters 12 through 14 you’ll understand how to explain the fundamental drives of your ambition. Students - Are you considering getting another degree as opposed to starting a business or going to work for an entrepreneurial business? Before you invest hundreds of thousands of dollars, read Chapter 3 to understand why credentials are getting less valuable even as degrees get more expensive. To ask other readers questions about The End of Jobs, please sign up. This is one of my all time favorite books about entrepreneurship. It's packed with brand new ideas and it's well written. It was the same old story. Entrepreneur X makes a risky choice, venturing off on his own in lieu of taking a stable job. He learns about the power of working independently, building knowledge, and providing value to others. He writes a book about how you can do it too. This is the same story Tim Ferriss told us back in 2007 with The Four Hour Workweek. It’s the same story I tell in The Connection Algorithm. And now, it’s the same story Taylor Pearson is telling us in The End of Jobs. When I saw the title and the subtitle, I thought to myself, “Another entrepreneurship book? Really?” I was nervous to release my book because I wanted to avoid that exact response, and yet here I was, having the same knee-jerk reaction to a similar title. Despite my reaction, Taylor’s book sales are through the roof. People are buying it in droves. It’s an instant bestseller. While the narrative sounds painfully overplayed, it somehow feels fundamentally different. The shoppers on Amazon are telling us this with their wallets. So, what is happening here? What makes The Four Hour Workweek more relevant today than it has ever been? And what is causing so many people to buy Taylor’s book, and my book? On the edges of society, there’s a shift happening. People in cubicles across America can feel it. They’re curious about it, but it’s difficult to understand. The End of Jobs makes it crystal clear, which is also precisely why it’s selling so well. It explains why, contrary to popular belief, investing in entrepreneurship is a smart and safe bet to make at this particular time in our nation’s history. Taylor describes how civilization has taken us through various phases of power and control — from the church, to monarchs, to banks, to corporations. In each phase, the dominant institution is overtaken by a group of people holding a new resource in high demand. This resource, often initially seen as risky or unstable, slowly morphs into the dominant form of power and profit, until it reaches peak saturation and effectiveness, at which point the cycle repeats. Taylor explains how America, and much of the world at large, is currently experiencing another peak, namely — peak jobs. To borrow from Taylor’s rhetoric, a “job” in this case is defined as working for someone else and performing tasks that aren’t driving your own knowledge and interests forward. You can think of it as a worker on an assembly line. This person is simply performing a task and getting a paycheck. He isn’t gaining anything for himself in terms of knowledge capital. He’s just performing his duty. As we transitioned from the Industrial Age into the Information Age, these “assembly-line jobs” declined. Machines took over most of the rote tasks, forcing us humans to use our brains and become more than just a finger pushing a button. This departure from mindless tasks, along with the proliferation of technology, created a new landscape of jobs. More specifically, in the Information Age, demand shifted from menial labor to knowledge-based labor. When knowledge became the valuable resource, credentials became the most popular measure of that resource. Young people started attending college and graduate school to obtain their diploma — their ticket to stability and success. Unfortunately, over the last twenty five years, as more and more people have flooded into universities despite increased costs, the value of a degree has drastically declined. It has become a saturated asset. The valuable resource has once again changed — and it now lies in entrepreneurship. The traditional path of the past century is rapidly becoming less stable, less effective, and therefore less appealing. A college degree is no longer a badge that grants you access to the workforce. It’s now an expected commodity, and doesn’t guarantee much of anything. Because jobs as we currently understand them are increasingly being taken over by machines or processed overseas, companies are downsizing their staffs, leaving only the members who make the organization run — the knowledge workers. But even if you’re among these knowledge workers, the heightened competition for such roles means employers are more likely to drop you for someone more qualified, or less expensive. There is no security and no stability. Your job could be stolen from you at any moment. What was once safe is now risky. What was once risky is now safe. Power is shifting away from corporations, and toward the individual. As entrepreneurs, we can now skip the middlemen and rely on ourselves — with unprecedented stability. The same technologies that are derailing security in the corporate world are bringing limitless opportunity to the world of the entrepreneur. The knowledge-focused market that was once owned by CEOs is now accessible to everyone. The internet has created an open, meritocratic platform, enabling transactions between anyone in the world. Creatives are starting to realize this. Designers, musicians, writers, engineers, and inventors are all now able to profit from their unique skills, without being tied to an institution. The whole process can be done independently. We can now learn how to do something valuable (from the internet), and effortlessly offer that value to customers with the click of a button (through the internet). So, if the Information Age has forced us to become knowledge workers, and the nature of this environment eradicates job security within corporations, and we now have a free platform for easily sharing our knowledge for profit, why wouldn’t we just become the operator of our own knowledge and control our own destiny? Why tie ourselves to a third-party system (the corporate world) that’s arguably now less stable than investing in ourselves and building our own personal equity (which can never be taken away from us)? One of the problems of the past was capital. But that problem has been solved, too. Technology, crowdfunding platforms, the sharing economy, and accelerator programs are enabling entrepreneurship like never before — and this trend will only continue to build momentum. Ten years ago, I couldn’t make money from renting out my apartment on Airbnb, or teaching an online course on Udemy, or driving people around in my car with Uber. Today, I can. Ten years ago, I couldn’t pitch my product to the entire world on Kickstarter or Indiegogo. And I couldn’t join accelerator programs like Techstars or 500 Startups to launch my company without any Angel money or institutional backing. Today I can. Funding projects and making money on the side has never been easier. The infrastructure is already solid, but these types of services are sprouting up every day, enabling more and more people to hit the eject button on the corporate world and spend time on their own entrepreneurial endeavors. In The Connection Algorithm, I describe a state-of-being called ZombieLand. ZombieLand is where you feel uninterested in what you’re doing — it’s the land of jobs. Most of us have fallen into this culture. We’ve been trudging up the Status-Quo Mountain for the past century, and we’re now at the peak. In my book, I didn’t spend enough time explaining why it’s time to take the leap out of the traditional workforce and into the entrepreneurial arena. Thankfully, Taylor Pearson has filled the gap. Simply put, The End of Jobs is a masterpiece. Taylor goes into far greater detail than I have here, building an almost infallible argument. And he does so with engaging prose, compelling evidence, and poignant examples. I fully expect it to become one of the top-selling and most influential business/lifestyle books of the next decade and beyond. One of the points I make in my book is that the extractable value of a trend is disproportionately weighted to when it first appears. In other words, it’s insanely valuable to “get in early.” Well, we’re now standing at the precipice of a massive trend: An exodus from jobs as we know it, and a growing army of entrepreneurs who will redefine our concept of work as we approach the second half of the 21st century. I hope you will join Taylor and me, along with countless others around the world who understand the benefit of getting in early. The opportunity won’t last forever. When I first saw Taylor’s book, which launched only a month after mine, my heart jumped with excitement. Without ever speaking to each other, we had both uncovered the same secret, at nearly the same time. This isn’t some miraculous miracle. It isn’t fate, or luck, or chance. It’s a sign. It’s a sign that we are, as Taylor so eloquently explains, at The End of Jobs. Do yourself a favor and pick up a copy of Taylor’s book right now. It will change the way you see the world, and equip you with the necessary mindset to succeed in this unique, transitional period of our history. If you’re interested in reading my book (which I think is a great compliment to The End of Jobs), you can get that here. Note: I should mention, as Taylor does, that investing in entrepreneurship does not preclude you from being an employee. You can work at a company and still be investing in entrepreneurship by using the Stair Step method (explained in Taylor’s book). Or, you can be an apprentice to another entrepreneur. On the flip side, you can also be a startup cofounder who just takes orders from your partners, in which case you’re not investing in entrepreneurship. The core of entrepreneurship lies in independent action, knowledge-building, and problem-solving: Starting something from nothing. Creating. Absolutely loved this book. At first I thought it would just be an interesting read, from a historical perspective. But as I got into it, more and more I was getting practical tips and ideas on what I could do myself to adapt to this new era moving forward, and inspiration on what all the "end of jobs" will mean to me and to the world. I'm going to say this is a must read if you are in college, starting your career, or at any point of your career. Just prepare to have your world view changed if Absolutely loved this book. At first I thought it would just be an interesting read, from a historical perspective. But as I got into it, more and more I was getting practical tips and ideas on what I could do myself to adapt to this new era moving forward, and inspiration on what all the "end of jobs" will mean to me and to the world. I'm going to say this is a must read if you are in college, starting your career, or at any point of your career. 2. Machines, both hardware and software, are taking over both blue collar AND white collar, knowledge-based jobs. 3. Everyone and their mom has a degree nowadays. They're becoming less valuable every year. He says that throughout history, there have been various limits to economic growth. In the Middle Ages, that limit was land. During the Enlightenment/Industrial Revolution era, the limit was capital. During the 20th century, the limit was knowledge. Nowadays, we don't have a collective lack of land or money or knowledge. What we need is creative solutions to problems. Our limit is entrepreneurship (ie, creativity and "complex/chaotic work"). Pearson asserts that we aren't in the middle of a global recession, we're merely "transitioning between two distinct economic periods". The longer we resist changing paradigms, the more personal risk we assume. We shouldn't be investing in college degrees anymore than we should be investing in blacksmithing. Instead, we should be learning and applying the entrepreneur's skill set (which is absolutely learnable) to create jobs for ourselves. The point of the book isn't that work is no more, but that "work" as we know it is changing. As we're starting to notice, the whole "go to college, get a job, do that job and climb the ranks for 50 years, retire" thing isn't happening anymore. This book explores why, and it makes predictions for where we're headed and what work is going to look like in the future. I thoroughly enjoyed this book, though it clearly played to my biases as a college dropout. I really like that it gave me a new way of viewing the world we currently live in, as well as a new way to look at what the world used to be. The historical perspective of economic limits was extremely interesting to me. I also enjoyed reading about the 4 types of work (obvious, complicated, complex, and chaotic) from the "Cynefin Framework". And I also liked that Pearson mentioned several people, companies, organizations, and books that supported his arguments/observations. I've bookmarked them all (and bought a few of the books) to look into soon. The book compares the traditional approach to career (job) with an emerging new one (entrepreneurship). More and more people work in complex organisations, where following the rules or best practices is not creating any value. Those organisations need individuals who can walk into chaos and create order. - Long tail phenomenon has been enabled by technology in last 2 decades. - We are experiencing exponential growth in many areas, but humans The book compares the traditional approach to career (job) with an emerging new one (entrepreneurship). More and more people work in complex organisations, where following the rules or best practices is not creating any value. Those organisations need individuals who can walk into chaos and create order. - We are experiencing exponential growth in many areas, but humans tend to assume that the world is linear. Exponential growth means that we live in a more chaotic world with growing number of extreme events that cannot be dealt with by people who just follow instructions. - Credentialism (e.g. college degrees, certificates), the safest career bet in 20th century is on the way out. Individuals are no longer competing to be more knowledgeable than a person down the street - we are all competing against everybody else thanks to the technological advances. - Most corporate jobs make us think that we create value. Steady income creates an illusion of steady value creation. It causes us to accumulate silent risks. - Humans like to work, but dislike the obligation of it - jobs make our natural tendency to grow break. - The Fourth Economy by Ron Davison - history of economy and how we are entering the fourth economy based on entrepreneurship. - The Turkey Effect (https://taylorpearson.me/extremistan/) - we assume, based on historical trends, that stable employment will be available for the next 50 years, because it's been the case for the last century. But the risks are higher than ever that this won't be the case. I am recycling this book. While I agree with the general thesis regarding entrepreneurship put forth by the author - if you could call it at that - I find the work unoriginal and repetitive. The book is full of stereotypes and quotes from other writers and entrepreneurs - and lacks data or a personal narrative. Taylor Pearson's main thesis is that entrepreneurship is cool, and is less risky, more profitable and more fulfilling than having a job. His book is also titled, "The End of Jobs" but whe I am recycling this book. While I agree with the general thesis regarding entrepreneurship put forth by the author - if you could call it at that - I find the work unoriginal and repetitive. The book is full of stereotypes and quotes from other writers and entrepreneurs - and lacks data or a personal narrative. Taylor Pearson's main thesis is that entrepreneurship is cool, and is less risky, more profitable and more fulfilling than having a job. His book is also titled, "The End of Jobs" but when you are successful as an entrepreneur, you create jobs. Pearson ends up sounding as though he's writing about a start-up lifestyle of micro-entrepreneurs who manage the digital equivalent of corner shops, without ever scaling. I take the point about "risk." Risk can be categorised in different ways. He is saying that while an entrepreneurship lifestyle involves taking risks, it also has a bigger upside. A corporate job, on the other hand, seems stable and secure but there is a latent risk of becoming outdated. In that sense, I get his point. But I find it problematic that he goes about saying in an overly cheery tone. A good business leader or a sensible entrepreneur knows that any decision involves trade-offs. I would not recommend anyone taking a financial risk to start a business base his/her decision on this book, please. Furthermore, a start-up position is in equal chance of getting disrupted as well. Business models get obsolete, too, just as jobs get obsolete. Both a corporate job and a start-up endeavour teaches anyone willing the skills necessary to move on and navigate the dynamic economy. Being an entrepreneur is not the panacea for all ills in the world. I also find the stereotypes problematic. One of his passages is titled, "How safe is it to be an accountant?" At another point, he talks about people dreaming to work at a corporation for decades. Such sentiment may have held true in the corporate America back in the fifties, but this is quite a different landscape among millennials today. His extolling of an entrepreneurship lifestyle is overly conceited as well. To put this book in contrast with Shoe Dog, for example, Phil Knight had a much more secure and authentic tone, compared to this guy. Being an entrepreneur does not mean you are free from the 9-to-5 lifestyle. It is enjoyable but it is also extremely difficult. You end up having to make a gut-wrenching call, and you worry about the comfort and security of your team on your payroll. It is a serious endeavor, not a whimsical exercise filled with whiskey and Thai prostitutes as Taylor Pearson makes it out to be (in his opening chapter). If anything, as a start-up leader, you end up having to answer to many more stakeholders. Freedom from the 9-to-5 is a weird way to frame entrepreneurship. If you don't want to scale but remain small, sure, you can get away without having to answer to stakeholders. Many successful entrepreneurs I know also have had a successful career prior. Phil Knight, again, worked as an accountant for the first 5 years of Nike. Lonely Planet founders have an MBA. Lawyers make great additions to your start-up team. There is no magical allure around entrepreneurs. Judging from the examples Taylor Pearson uses, I have a feeling that this book is intended for white "toe-ma-pout" Americans graduating into the last recession, making an arbitrage by going to Southeast Asia with cheap beer / special massages / more accessible living costs, and running small online businesses without ever scaling. The colonial attitude seeps through the text. A call-to-arms for a new age of entrepreneurship. The End of Jobs makes a compelling argument that globalisation and the democratisation of production and distribution mean it has never been easier or more fruitful to become an entrepreneur. Arguably, taking a traditional career is now the more risky pathway. If all this 'describe a change in the world' stuff isn't your cup of tea, just skip past it. Where this book really shines is in providing a fully-formed blueprint of how to start an online A call-to-arms for a new age of entrepreneurship. 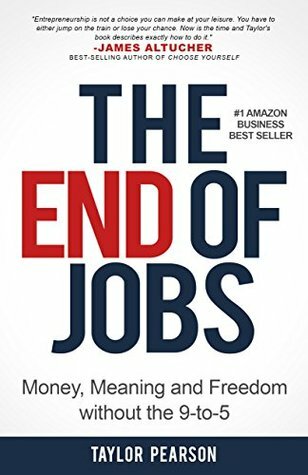 The End of Jobs makes a compelling argument that globalisation and the democratisation of production and distribution mean it has never been easier or more fruitful to become an entrepreneur. Arguably, taking a traditional career is now the more risky pathway. If all this 'describe a change in the world' stuff isn't your cup of tea, just skip past it. Where this book really shines is in providing a fully-formed blueprint of how to start an online business, backed up with case studies and examples and strategies. It feels like the perfect companion to popular books like the 4 Hour Work-Week, which are great at selling the dream but somewhat lacking in the specifics. Really enjoyed the book & many insights into why the era of resources, then knowledge is now over, and the new era of entrepreneurship is upon us. Many cool stories of people giving up their 9 to 5 dull jobs & stairstepping into creating businesses. Surprisingly a good read! This book was phenomenal the second time through. The author, Taylor Pearson, has a background in blogging and essay writing, and the style in his book reflects the quick pace common in online content. The paragraphs are really short and chapters go by in a few minutes, so the book only takes a few hours to read in its entirety. I love how clearly Taylor can breakdown complex ideas. He is very repetitive, but I find what he repeats to be very beneficial and ultimately worth repeating. The book b This book was phenomenal the second time through. The author, Taylor Pearson, has a background in blogging and essay writing, and the style in his book reflects the quick pace common in online content. The paragraphs are really short and chapters go by in a few minutes, so the book only takes a few hours to read in its entirety. The book boils down to a few core concepts. I've listed a few that come top of mind. Based on major macro-trends (think Globalization, Technological Progress, Automation), it is becoming clear that traditional jobs are a less secure social script than ever before whereas the opportunities in entrepreneurship have never been better. The 'Stair-Step' method and Apprenticeships provide compelling social scripts for entrepreneurship. No different than anything else (Sales, Marketing, Project Management), Entrepreneurship is a skill set that can be invested in. College is increasing in cost but decreasing in value. There are more graduates each year than relevant job openings. There are equally skilled knowledge workers overseas that are much more affordable to higher on a full-time, part-time, or contract basis. Capital is abundant, time is scarce. Employees accumulate 'silent risk.' Artisans and entrepreneurs operate with consistent feedback and have notice for changes they need to account for. SAAS, the sharing economy, contracted work, and self-education have lowered startup and maintenance costs for entrepreneurs. Blogs, YouTube, and podcasts make it easy to reach customers, and new niche markets are created every day. The pursuit of entrepreneurship is a synergistic path with opportunities for personal freedom, wealth creation, and finding meaning in life. Everything I've read of Taylor's has been stellar, and this book is no exception. My appreciation for this book was definitely improved by having already read most of it's major sources of influence. Examples include Nassim Taleb's Incerto Series, Dan Ariely's Predictably Irrational, Tim Ferriss' Four Hour Workweek, MJ Demarco's Unscripted and Millionaire Fastlane, and most of Taylor's Blog. I first read the End of Jobs in September of 2018. It took me two days to read the book that time. I decided to buy a paper copy and had it on my 'reread' list for a while. I decided to pick it up last night and I finished it roughly 24 hours later. I found this book thought-provoking, but it gave me very little information I had not already absorbed osmotically through the internet. However, it did collect the information and distill it, which made the read worthwhile, even though much of it felt like review. It served as affirmation in my decision not to pursue a college degree — the return on the investment does not warrant the expense — and it made me contemplate how to take advantage of niche markets and how to leverage existing skills I found this book thought-provoking, but it gave me very little information I had not already absorbed osmotically through the internet. However, it did collect the information and distill it, which made the read worthwhile, even though much of it felt like review. It served as affirmation in my decision not to pursue a college degree — the return on the investment does not warrant the expense — and it made me contemplate how to take advantage of niche markets and how to leverage existing skills. The book's focus on entrepreneurship was mainly on selling products, not services, and thus was not wholly applicable to my life. I sell a service, which means I am selling both my skills and my time, and since time is the only limited resource, I cannot scale it the way one could scale a physical or digital product. I would be curious to see how he would address entrepreneurship from the standpoint of selling finite time. Filled with interesting insights and thoughts that I value, I have found some good motivation from. 1. It's incredibly repetitive. The same interesting insights are repeated 5-10 times it felt like, so sometimes it feels like it's being padded for length unnecessarily. Keeping it succinct would have felt more valuable to me and my time. 2. Though "freedom" felt like a good motivator for why to approach the economy differently which he cites a couple o Filled with interesting insights and thoughts that I value, I have found some good motivation from. 2. Though "freedom" felt like a good motivator for why to approach the economy differently which he cites a couple of times, more prevalently the author's underlying motivation feels simply driven by money - which in one sense is to be expected by a book like this, maybe. He holds up in reasonably high esteem people who drive ridiculous cars and such. To me, I am inspired by a new way of thinking, how I can connect my kids in with the changing economy so they can have the right mindset in tomorrow's marketplace. Being motivated by wealth alone rings hollow and boorish to me. 3. His attitude seems to be there are entrepreneurs and workers - leaders and followers - geniuses and suckers. It feels like he's almost looking down on everyone else. The evolving economy needs to shape answers to how we can create connection points for all personality types and all contributors. It's not realistic for everyone to be an entrepreneur. So some smart entrepreneurs will help shape the future of work for the masses in a way that they're not just means to an end, but mutually benefit from the opportunities in this dynamic and emerging world. 4. His repeated use of "Extremistan" and "Mediocristan" was tiring and also reflected in what felt like an elitist view looking down on the rest of the world. I had a long-standing love/hate relationship with the word "entrepreneur" because my background is deeply rooted in a secure, job framework - government service. This said, I realized even in that setting that successful people (i.e. the ones getting promoted or being put on plum projects) were successful because they were accomplished in skills like networking, communications, developing relationships and generating ideas. These are the same skills that mark entrepreneurs. Taylor has now helped me view entrepreneur not as a title (which I do not apply to myself nor ever will) but as a set of skills. This is key because despite the well voice argument in the book that entrepreneurship is the path most must go, the fact is that many will still choose to work for other companies, the government, join the military or work for a non-profit. The skills of an entrepreneur can yield massive leverage in these situations as well. This book confirmed and brought to the surface a long buried notion of mine; the secret to entrepreneurship in not something that you find in a book. Not to say that is the book is not good, the very opposite. I feel that Tyler has ensconced this idea in this book. Limits have changed. Jobs and the traditional school to college to career conveyor belt is off track with human progress. The world is full of college graduates making the prospect of a degree and the work associated with it a huge wa This book confirmed and brought to the surface a long buried notion of mine; the secret to entrepreneurship in not something that you find in a book. Not to say that is the book is not good, the very opposite. I feel that Tyler has ensconced this idea in this book. Limits have changed. Jobs and the traditional school to college to career conveyor belt is off track with human progress. The world is full of college graduates making the prospect of a degree and the work associated with it a huge wager. A wager whose outcome is ever increasingly dependent more competitive performance; Performance that has no connection to the ability to provide value to others. The way of the future is entrepreneurship, and it is something worth investing in. End of jobs is a blog-post-like summary of other popular books (antifragile, man's search for meaning, capital in the 21st century, four hour work week, etc) which adds very little new or original thought to the matter. The summary is simple: Society is evolving and technology has enabled new methods for non-traditional employment which is the key to greater happiness and freedom and meaning in your life. It appropriately captures the broader trend but generalizes too often and uses excessive hy End of jobs is a blog-post-like summary of other popular books (antifragile, man's search for meaning, capital in the 21st century, four hour work week, etc) which adds very little new or original thought to the matter. The summary is simple: Society is evolving and technology has enabled new methods for non-traditional employment which is the key to greater happiness and freedom and meaning in your life. It appropriately captures the broader trend but generalizes too often and uses excessive hyperbole and scaremongering to try and make its point. I'll go the cited books and read them for deeper analysis of the trends. Summary: A big tsunami is coming to wipe out jobs as we have known them. But hey, it's never been easier to be an entrepreneur. A convincing book, particularly as we see the concept of the secure career-long job crumble and the rise of the contract and sites such as Airtasker and Freelancer. More and more jobs are being automated or moved 'offshore'. This book is a very good heads-up, with a stirring finish. This book shows the signs of trends to come for resources and professional services. There are additional tools online that support the book. Great insight into what I also personally believe (and in some ways hope) will be the future. Pearson is as sharp as they come. If the goal was to beat the reader to death with redundancies, then it almost worked. Makes a good case. I'm going to read it again and try to verify what he states. I enjoyed reading this book. It has a lot of insights into the notion of job or working in companies and how as an individual we can do and achieve much more than what we have been made to believe. The book stresses upon why Entrepreneurship is always better then being in a job. This isn't true in all cases. What he's trying to tell is that people who work for big companies are often not motivated and have very poor performance. Smaller companies which have a great work environment and give their I enjoyed reading this book. It has a lot of insights into the notion of job or working in companies and how as an individual we can do and achieve much more than what we have been made to believe. Smaller companies which have a great work environment and give their employees freedom to work and do what they like is the perfect place to be an apprentice. This allows the employees to learn and grow quickly and then start his or her own company. There are great insights and stories and highly meaningful analogies on why we need to be an entrepreneur even though if we are working. This book has been written for the masses to tell them that in the age of Internet, we can build more wealth than we think possible and anyone can do it provided the right dedication exists. I didn't like the way it was written. It lacks interesting content and it's full of tiny examples that are left there, sometimes out of context. Based only on assumptions and predictions. He tells how, in his opinion, most jobs are not safe anymore because they may be taken by other people in developing countries with the same level of education of people in western countries, who accept lower pay. This concept is repeated many times in the book and it seems like he is writing this book for a ve I didn't like the way it was written. It lacks interesting content and it's full of tiny examples that are left there, sometimes out of context. Based only on assumptions and predictions. He tells how, in his opinion, most jobs are not safe anymore because they may be taken by other people in developing countries with the same level of education of people in western countries, who accept lower pay. This concept is repeated many times in the book and it seems like he is writing this book for a very well defined American audience. I was expecting a lot more. I pushed myself to finish it even though I thought about stopping halfway through. In the last part of the book, the author presents us the concept of pursuit of meaning, as theorized by Viktor Frankl. It'd have been a nice approach to frame entrepreneurship on the pursuit of meaning to oneself's life and how it could improve other people's lives. But he opted for assuming that the ultimate goals are seeking 'freedom' and wealth. While wealth can be a possible metric to define a successful enterprise, this vision lacks empathy towards entrepreneurship as a way to improve societ In the last part of the book, the author presents us the concept of pursuit of meaning, as theorized by Viktor Frankl. It'd have been a nice approach to frame entrepreneurship on the pursuit of meaning to oneself's life and how it could improve other people's lives. But he opted for assuming that the ultimate goals are seeking 'freedom' and wealth. While wealth can be a possible metric to define a successful enterprise, this vision lacks empathy towards entrepreneurship as a way to improve society overall. The author assumes a pretty meritocratic view, failing to realize that before sheer will there's a lack of access to the same opportunities. If feels like this is book written for young, affluent, white Americans, and those who can allow themselves to abide by the same ideologies. Taylor Pearson does an excellent job of dissecting the chasm between the industrial age and the information age we currently live in. He cites that working a job is, in fact, riskier than entrepreneurship. Not only that, but he takes us through several case studies demonstrating how entrepreneurship can be an extremely profitable venture. 5 Ways I applied information Taylor Pearson does an excellent job of dissecting the chasm between the industrial age and the information age we currently live in. "Entrepreneurship expands your power to design your life. You are a part of the first generation that has radical access to the tools of production. Rather than choosing from a set of options, you can design your own." It was an interesting read and I agree with the author regarding his thesis on the end of jobs. It's kind of a recap of many other books on the subject. The author made a structured synthesis of those books and added his own bits to it. If you've read these books you'll get less value for this book than if you didn't. A good, quick read. Covers some familiar territory regarding how jobs are changing and freelancing and entrepreneurship are becoming more important than trying to find security as an employee. Includes some interesting historical context on employment and suggestions on how education and society can adapt to the new realities. Taylor Pearson always shares his interesting insights in Twitter and found his ideas interesting. I thought I might read his book to learn a thing or two and equip myself better. To my disappointment, I found the book to be repetitive, vague and unoriginal. The only saving grace of the book is that he has shared his link to access many useful productivity tools. Un livre qui nous montre quel sont les stratégies à adopter dans un monde en constant changement. Une nouvelle vision du capitalisme qui nous pousse à monter son entreprise digitale pour plus de liberté. J'ai beaucoup apprécié la précision de l'auteur dans ces propos. On sens le travail de recherche et on y retrouve beaucoup d'informations qui appuient ses propos sur la transition économique. Taylor spent the last three years meeting with hundreds of entrepreneurs from Los Angeles to Vietnam, Brazil to New York, and worked with dozens of them, in industries from cat furniture to dating, helping them to grow their businesses. Regardless of the industry, age, race, country, or gender, one simple fact stood out: entrepreneurship was dramatically more accessible, profitable, and safer… whil Taylor spent the last three years meeting with hundreds of entrepreneurs from Los Angeles to Vietnam, Brazil to New York, and worked with dozens of them, in industries from cat furniture to dating, helping them to grow their businesses. Regardless of the industry, age, race, country, or gender, one simple fact stood out: entrepreneurship was dramatically more accessible, profitable, and safer… while jobs were riskier and less profitable than the public is typically (mis)led to believe.